Let me just say that when Revlon calls a product "ColorSTAY", they totally mean it. Cooper found my "Red Velvet" lipstick and decided to make himself pretty. After quickly taking this photo, I plopped him in the tub. No matter how much soap I used or how hard I scrubbed, the lipstick remained. I called my mother in a panic. She suggested baby oil. It was miraculous. Cooper enjoyed how slippery his skin felt. He kept rubbing his arms together and smiling. 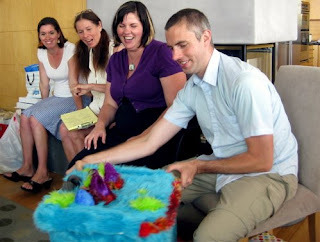 When I got the invitation to Ryan and Jenny's baby shower, I knew I was going to make a gift that was strange...strange and furry. My goal was to create something that looked like it belonged on The Muppet Show. 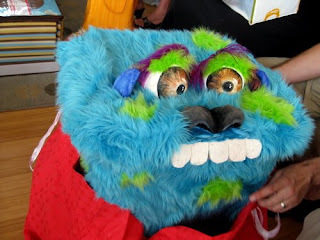 The year I left for college, my sister made me a hamper that had eyes and teeth and was covered in fur. It was one of the best gifts I've ever received. 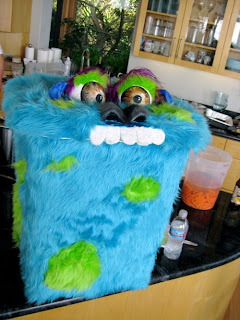 I bought a flip-top hamper and started concocting my laundry monster for the Wee Gantz's nursery. 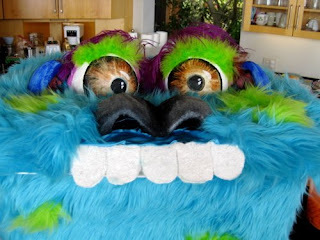 I ordered turquoise and neon green fur. I carved a foam nose and some ears. I painted eyes. I added feathers. 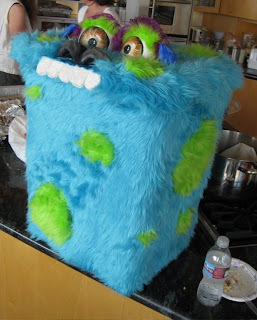 Many hours and many, many, many hot glue sticks later, the hamper was complete. 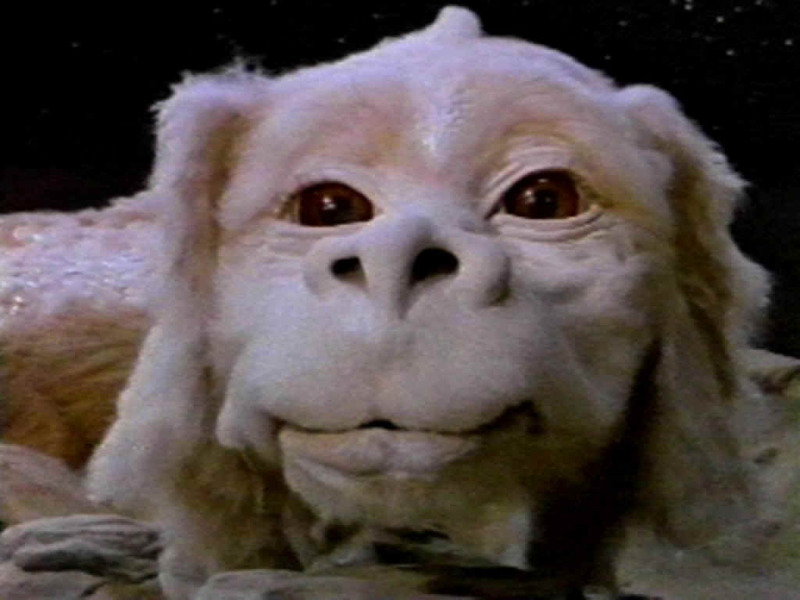 The finished product looks like a cross between Falcor from The NeverEnding Story and , Sully from Monsters Inc. 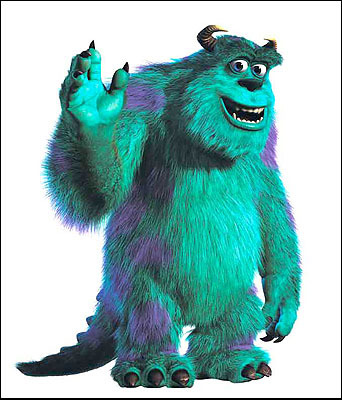 It sort of looks like a big, blue beaver, too. * Listening to more than six songs by either Elliott Smith or Aimee Mann. * Getting a haircut that makes you look 40. 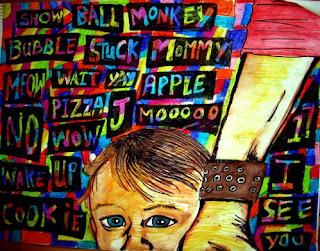 * A cranky toddler throwing instant oatmeal at your face. * Watching "The Brave One." I was in high school when I saw Terry Zwigoff's documentary on Crumb and I instantly became a fan. His stuff was ugly and beautiful and satirical and sexual and attractive and uncomfortable. I liked the way he drew woman. I knew people thought his work was misogynistic, but I saw girls that were big and round like me and I liked it. Jakob put the book in there on purpose. He wanted me to sketch. He knew that I'd start sketching if I started thumbing through Crumb comics. I've always been a doodler. I'm constantly clogging the margins of my journals with odd illustrations of tree people and pigs and such. 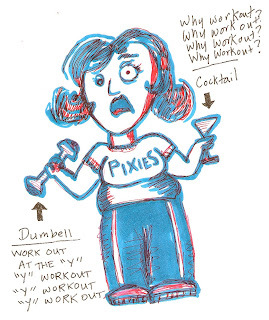 I drew this one after my workout at the YMCA. I was wearing my Pixies shirt and two different people said "nice shirt." I hate exercise. I hate dieting. I love being sedentary. I'm way good at it. My doctor has advised me to lose weight. I'm really going to try this time. I'm using my son as inspiration. I want to be the best mom I can be and that means being healthier. Dickens was talking about San Diego, right? 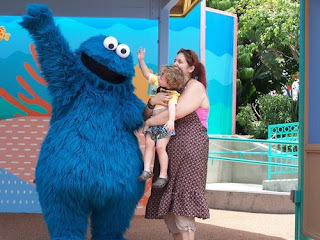 Sea World recently opened what I can only describe as "Elmo's Ultimate Toddler Chaos!" It's a Sesame Street themed section of the park. 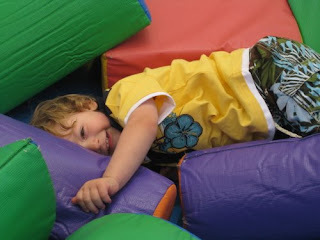 It's basically a lot of well-padded areas where kids can scream and freak out. 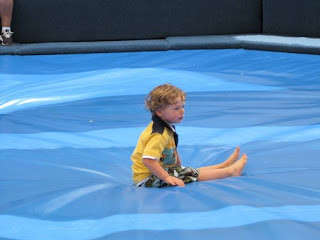 Cooper loved it, but he kept crashing into other kids and making them fall over. 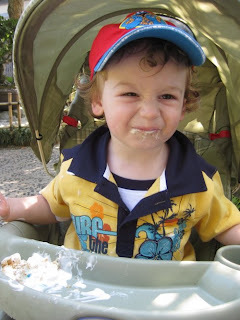 An uptight one-year-old in a floppy hat HATED my son. It was hard to see his expression beneath the ridiculously over-sized hat, but I did hear him yell "Stop, you!" right at Coop and then (I think) he rolled his eyes and shook his head. Cooper met Cookie Monster. Yes. THE Cookie Monster. He was overwhelmed. His little brain blew a fuse. He got to see and touch his fave tv celeb. A line began to form so I started to pull Cooper away. "Say bye to Cookie," I said gingerly. 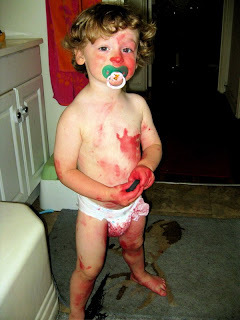 Then my lovely little child lost his s**t! He began to yelp, "Wait! WAIT!" His little hands were trying to grasp at the blue fur. He sobbed. He begged. For several minutes he was simply inconsolable. Ice cream eased the suffering. The stingray pond was very crowded. 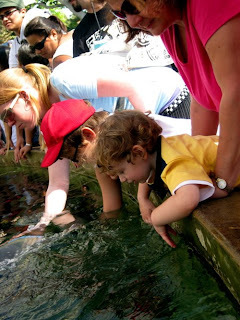 You could pay $1 for some fish to feed them, but since Coop seemed more interested in splashing the water rather than viewing the marine life, I decided to save my 100 cents. 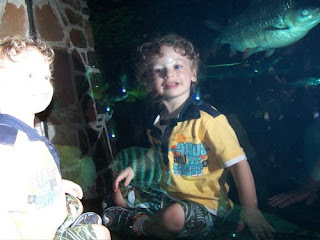 Coop's favorite thing (besides meeting his furry, blue idol) was the aquarium. 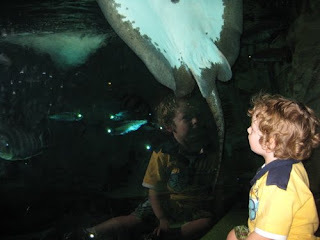 Each section we entered, he would yell 'FISH!" He watched them swim. He saw a frog and said, "ribbit." There were more meltdowns and tantrums. I wish he'd stop flopping on the ground like a mackerel. I'm not a fan of that move.